Service: Compatible gases and liquids. Wetted Materials: 316L Stainless Steel Bourdon tube & connection. Housing: Fiberglass reinforced Polypropylene with safety glass. Accuracy: ±0.5% full scale, ASME B40.1, Grade 2A. 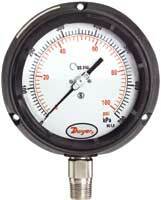 Pressure Limit: 130% of full scale for ranges 8000 psi or less. 115% of full scale for ranges greater than 8000 psi. Temperature Limit: Ambient: -4 to 150°F (-20 to 65°C); Process: 300°F max (150°C max). Process Connection: 1/2" male NPT. Enclosure Rating: NEMA 3 (IP55). Weight: 23 oz (650 g).